Let’s talk Cava. Spain’s answer to Champagne may inhabit a value price point on the shelf, but it can often punch way above its weight, made in similarly intricate methods as Champagne, with a distinctive personality from Spanish grapes and a warm-climate flair. In a 2017 Decanter article, Andrew Jefford called it “a force for liberation in the sparkling wine world,” and I daresay I agree—at least for the fact that it provides an alternative model for sparkling wine than the extreme-climate, Pinot- and Chardonnay-dominated wines of the Champagne region, which are often emulated but rarely replicated in other terroir. Spain proves that warm-climate sparklers can be taken seriously, without relying on Chardonnay and Pinot Noir, but on indigenous grapes. Catalonia is the hometown for Cava, where it was first made by José Raventós (forefather of Raventós i Blanc) after a visit to France in 1872, but it is not the only place where it can be grown. In fact, Cava is unique in that its Denominación de Origen is tied to its method of production, not region. Ninety-five percent of Cava is still made in Catalonia, but you’ll find DO Cava from Valencia, Aragon, Navarra, Rioja, and Basque Country. Does that mean that it’s not as terroir-driven? Not necessarily. There are plenty of producers deeply focused on geography as well as native grapes (Macabeu—fruity and expressive; Parellada—aromatic with high acidity; and Xarel-lo—the structuring force behind the wines). And, recently, there’s been movement in the Spanish sparkling wine circle to redefine itself. In 2014, a new classification for single-vineyard Cava called Cava del Paraje Calificado was introduced. Others are eschewing the Cava DO altogether, pronouncing loyalty to place over production by appellating their wines to Penedès or other regions instead of Cava. 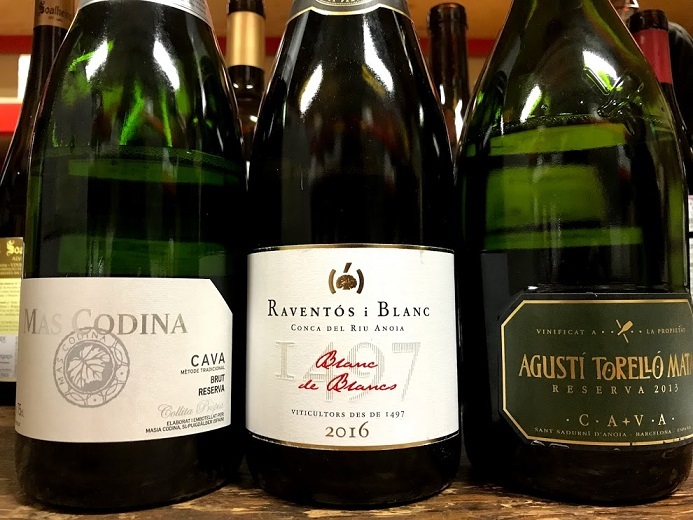 Raventós i Blanc was a pioneers in this (as they are in so many things Cava), using the Conca del Riu Anoia appellation to reflect their geography. We have a great examples on our shelves, and here are three that showcase the breadth of Cava styles. A Reserva for $12.99! This means that it sees the same amount of lees aging as most non-vintage Champagnes but it’s about three times cheaper. It’s fruity and bright on the nose with sweet fruit and richness on the palate. Finishes with great acidity and freshness. A screaming deal! This producer has long been a benchmark for Spanish sparklers, and is still creating beautifully balanced, complex wines with a bright, fruity expression of all that Spanish sunshine. They grow their grapes biodynamically. This estate-grown wine is gracefully in balance with lots of citrus and stone fruits and acidity. Very elegant. This was my favorite of our recent staff tasting. A vintage wine with 6 years on it already for under 20 bucks! Tons of complexity with hints of toasty brioche, almonds, and tangerine. Broad and sumptuous on the palate with a long, lip-smacking finish. Lots of interestingness. It spends 36 months on the lees, which is nothing to shake a stick at (and is the minimum for vintage Champagnes). We’re pouring wines from Spain and Portugal in all three stores today, so come try some of these for yourselves. SF 12-3 / RWC 1-4 / LA 3-5:30 $20. Join us and bask (pun intended) in a taste of that sweet, sweet Iberian sunshine.